Bob cradled the little girl's head against his shoulder and began to tell a story . 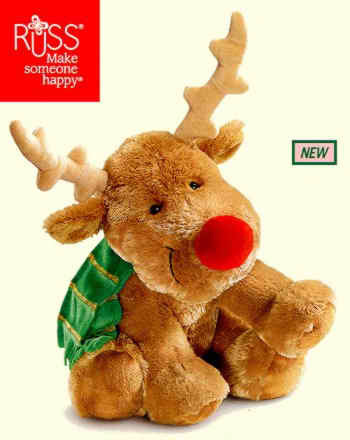 . .
"Once upon a time, there was a reindeer named Rudolph, the only reindeer in the world that had a big red nose. Naturally people called him "Rudolph, the red-nosed reindeer." As Bob went on to tell about Rudolph, he tried desperately to communicate to Barbara the knowledge that, even though some creatures of God are strange and different, they often enjoy the miraculous power to make others happy. "Rudolph," Bob explained, "was terribly embarrassed by his unique nose. Other reindeer laughed at him; his mother and father and sister were mortified, too. Even Rudolph wallowed in self pity." "Why was I born with such a terrible nose?" he cried. "Well," continued Bob, "one Christmas eve, Santa Claus got his team of husky reindeer - Dasher, Dancer, Prancer, and Vixen, and the others -- ready for their yearly trip around the world. The entire reindeer community assembled to cheer these great heroes on their way. But, a terrible fog engulfed the earth that evening, and Santa knew that the mist was so thick that he wouldn't be able to find a single chimney." snow and sleet -- nothing bothered Rudolph for his bright red nose penetrated like a beacon." "And, so it was that Rudolph became the most famous and beloved of all the reindeer. The huge red nose he once hid in shame was now the envy of every buck and doe in the reindeer world. Santa Claus told everyone that Rudolph had saved the day, and from that Christmas on, Rudolph has been living serenely and happy." Little Barbara laughed with glee when her father had finished. Every night she begged him to repeat the tale until finally Bob could rattle it off in his sleep. Then, at Christmas time, he decided to make the story into a poem like the 'Night Before Christmas' and prepare it in a booklet form with crude illustrations, for Barbara's personal gift. Night after night, Bob worked on the verses after Barbara had gone to bed, for he was determined that his daughter should have a worthwhile gift, even though he could not afford to buy one. Then, as Bob was about to put the finishing touches on Rudolph, tragedy struck. Evelyn May died. Bob, his hopes crushed, turned to Barbara as his chief comfort. Yet, despite his grief, he sat at his desk in the quiet, now lonely apartment, and worked on Rudolph with tears in his eyes. Shortly after Barbara had cried with joy over his handmade gift on Christmas morning, Bob was asked to an employee's holiday party at Montgomery Wards. He didn't want to go, but his office associates insisted. the poem and read it to the crowd. At first the noisy throng listened in laughter and gaiety. Then, they became silent, and at the end broke into spontaneous applause. That was in 1938. 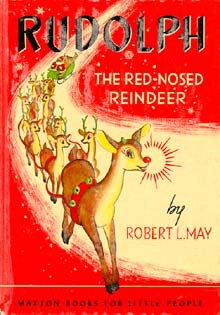 By Christmas of 1947, some 6 million copies of the booklet had been given away or sold, making Rudolph one of the most widely distributed books in the world. 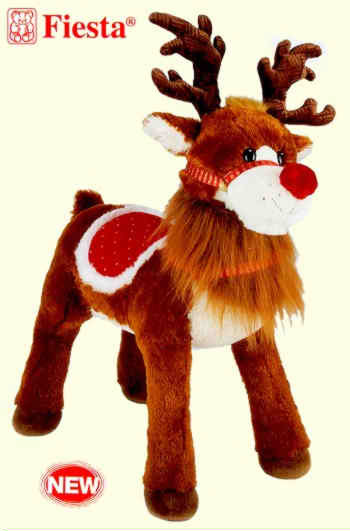 The demand for Rudolph sponsored products increased so much in variety and number that educators and historians predicted Rudolph would occupy a permanent niche in the Christmas legend. inspired him to write the story. In 1949, Robert's brother-in-law, Johnny Marks wrote the song, "Rudolph the Red-Nosed Reindeer," based on Robert's book. Bing Crosby and Dinah Shore. Gene Autry was included as an afterthought. Autry had enjoyed a resounding success with "Here Comes Santa Claus," which he co-wrote and recorded in 1947. Seeking a follow-up Christmas hit, Autry selected three songs for a four-song recording session. He passed over "Rudolph," saying, "There are already too many reindeer flying around." But Ina, his wife, liked the song. "Oh, Gene," she told him, "it reminds me of the story of the Ugly Duckling. I think you ought to give it a try. The kids will love it." As time ran out in the recording session, Autry decided to go with the reindeer song. It was an "only take," and the payoff since for those few minutes has been phenomenal. Autry recorded the song and by 1950 it was the most popular Christmas song on the radio. Within three weeks of its release, Autry's "Rudolph the Red-Nosed Reindeer" hit the top of the charts. Marks became known as a Christmas composer and named his publishing company St. Nicholas Music, Inc. Marks wrote "Rockin' Around the Christmas Tree," "A Holly Jolly Christmas," "The Most Wonderful Day of the Year," and "I Heard the Bells on Christmas Day." 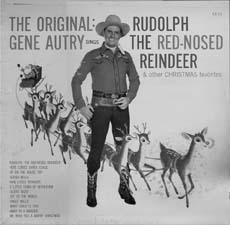 Autry recorded several other Marks songs during the next decade, but none achieved the success of "Rudolph." character and organized Rudolph the Red-Nosed Enterprises, Inc. The company promoted a book, a technicolor cartoon, a Barnum & Bailey circus act, and other spin-offs. The little reindeer led May to financial security.